Heyo folks, I'm back after slacking on updates for the summer. I have brought something interesting back with me this time though! Now, while his blog has focused primarily on Goosebumps books I have from time to time featured non Goosebumps books. So far these "other" books have been from other authors, such as Scary Stories to Tell in the Dark by Alvin Schwartz. 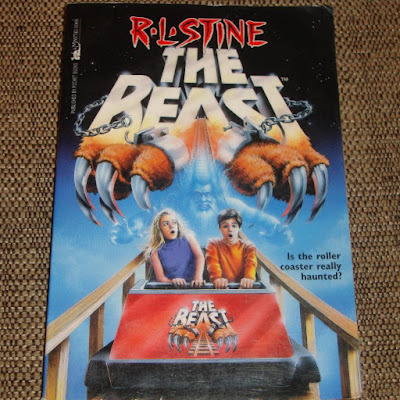 Well it has come time to go the other way and feature a book by RL Stine that is NOT a Goosebumps book. Now though Goosebumps was one of his big hits, RL Stine has been known for several different series. Fear Street is a big one, aimed at slightly older readers than Goosebumps. He has also done series like Mostly Ghostly, Rotten School, and even several joke books under the name "Jovial Bob Stine." This book, however is not part of any series! (Well except that it has it's own sequel.) It's called The Beast, and it's own thing. Perhaps it is aimed at the Fear Street audience though. The font for his name on the cover is the same as the Fear Street books at the time. Also Fear Street books are advertised in the back of the book. So what will this mysterious stand alone book be like? Perhaps it's just a Goosebumps book in disguise? Maybe it's something absolutely completely different? Maybe he just had a story that didn't fit in with any of his existing franchises? Well we'll see I suppose. Now let's talk about the cover art. It was done by Tim Jacobus who did almost all the original covers for the first run of Goosebumps. The illustration doesn't feel that much like his Goosebumps art though. A little bit less cartoony and bright. I wouldn't exactly call it scary though, more like... Confusing. The titular beast seems to in fact be a roller coaster. If the illustration is accurate, the spooky character in this book may not be a beast at all, but a ghost. "Is the roller coaster really haunted?" The cover asks? Well... 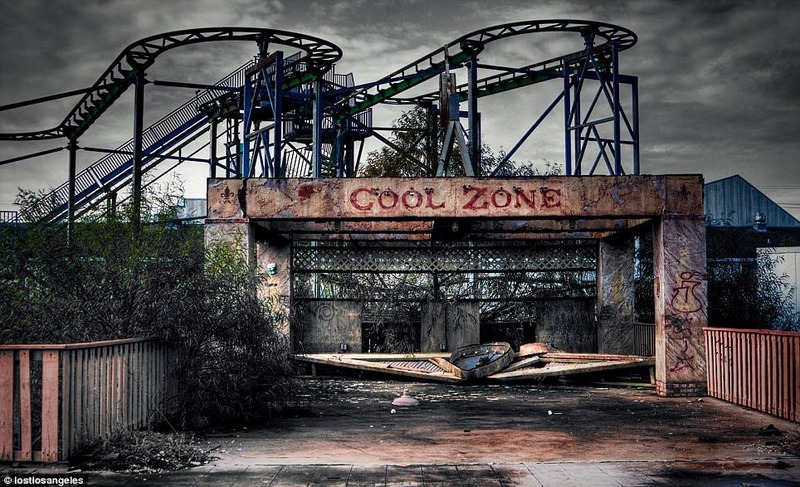 I'm not sure what's so scary about a haunted roller coaster. I suppose there are some hijinks a ghost could get into. Messing with the safety systems perhap? Pull the brake at odd times? The ghost itself is a bearded man that reminds me a bit of depictions of a neanderthal man. He is beastly in his own way I guess. Now I fear I have been yammering on too long about the cover. It's been awhile since I've written one of these. I think I am out of practice. Let's just read the damn book. We begin appropriately enough of the roller coaster called The Beast. 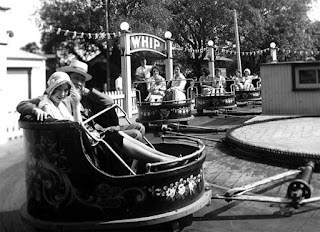 Young teens named James and his cousin Ashley are having an invigorating ride in the amusement park. They are at Paramount's King Island. I had to google this, to see if it's a real place. 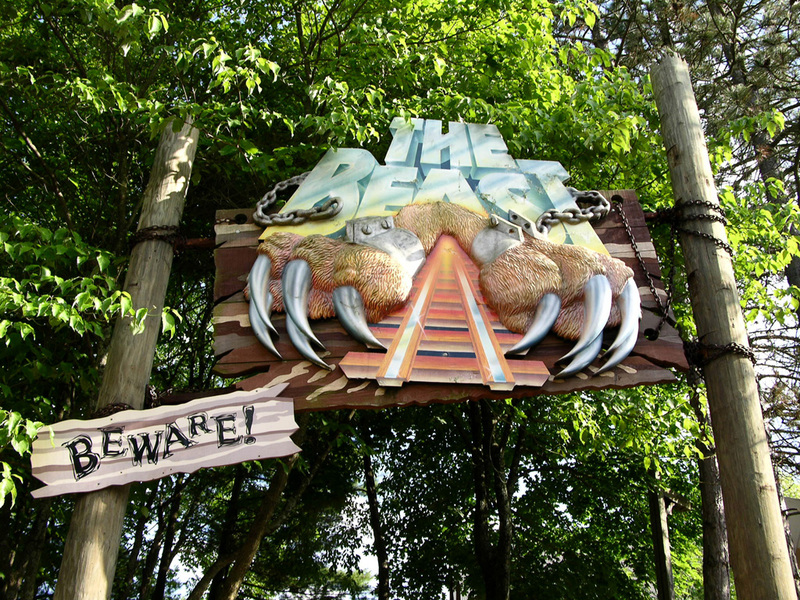 It is (though no longer owned by Paramount) and The Beast is in fact a real and very popular coaster. Not being a roller coaster aficionado like young James here, I had no idea! By chapter two while waiting in line for the very last Beast ride of the night, we find out that rollercoaster is in fact... HAUNTED. It seems every night a ghost rides the coaster after hours. I gotta say that isn't very scary by haunting standards but it seems like a lot of fun for the ghost. The ride ends. The park closes. James can't find Ashley. Did the ghost get her? This is page 17 so I'm going tos ay no. My intuition is right and the cousins do find each other. Each blames the other for being the one who got lost. Both are a bit unsettled to be in the vacant park late at night. It only gets worse when they realize they're locked in. Since this is the 90s instead of pulling out their cell phones they start to search for a pay phone. Then it dawns on them, what could be more fun than having an amusement park to yourself all night? Unless of course... it's haunted. Thus there is a bet. 10 dollars goes to Ashley if there is indeed a ghost that rides The Beast. After a brief run in with security and clumsiness by both kids they are there to witness the ghost for themselves. Surprisingly, the cars are running down the track. Could a ghost be aboard. They notice a strange man in overalls at the controls. Could he be the ghost? If he is, he is pretty solid. He talks to the kids and tells them his name is P.D. Walters. Do ghosts introduce themselves? Whether or not he is a ghost, he is pretty strange. He says he's been coming to the park for 60 years. That's longer than King Island has existed! Apparently before the current park, there was one named Firelight Park, named for all the torchest that lit it. It was a beautiful place before a tornado came and caused a fire. June of 1931, hundreds of park goers lost their lives in the tragedy. After that somber story, P.D. wants to cheer them up with a ride on The Beast. Who could say no? Not these kids, that's for sure. And who wouldn't be cheered up by a foggy night time rollercoaster ride while chased by security guards? Off the ride, things have taken an odd turn. Everything is different. There are no guards, no P.D., and there is music and children even though it is after hours. It doesn't even seem to be the same park anymore. Everything looks... Old. Like, I bet if this was an episode of a TV show this part would be in black and white. I have the distinct feeling that at any moment someone will say "23 skidoo!" In fact they do use old timey speech. They also are disturbed by the kids' attire. The past isn't so bad though, ice cream cones are only 2 cents a piece! Plus there is a barber shop quartet. Eventually a park guard they consults ends up getting angry that Ashley is in her "undergarments." Apparently they don't have shorts and shirts in the past. Time to flee! A brief delay in the freak sideshow and it is off again to lose the fuzz. Thankfully, the guard gets distracted by a missing baby the teens bump into a helpful boy named Paul. He leads them to a pile of used clothing, donated due to the great depression. Hey is this book EDUCATIONAL? On the search to find P.D., they treat helpful Paul some hotdog, since they only cost 3 cents. Plus some rides wouldn't hurt while they search for P.D. right? But amidst all the fun they find a newspaper with the date on it. The date it is awfully familiar... It is indeed the date where a tornado causes the park to burn down. Sadly, a couple of kids find it awfully hard to convince park guards that they are from the future so they know there is going to be a tornado. Whilst arguing with some workers at the main office they make a startling discover: young Paul is none other than P.D Walters, the man they have been looking for this whole time! Unfortunately for them all, Paul. D. Walters doesn't know how to send them to the future nor has he ever heard of The Beast. The wind kicks up. The kids frantically try to convince everyone of their impending doom. No dice. Paulie D escorts them out through a secret way he uses to sneak into the park. Miraculous standing outside is none other than The Beast, roller coaster cars at the ready. The two cousins enter, but P.D. doesn't make it. Some guards leap into the seats, and their last exciting coaster ride begins. At the end, the kids seem no worse for wear, but the guards have turned to skeletons. They are back in their own time. They figure the guards have aged to death.... which really doesn't make any sense but let's forget that for now. P.D. is nowhere to be seen. Modern guards at the park of the present catch them and begin to usher them out of the park, arranging for their parents to get them Strangely though, they have never heard of P.D. No one by his description has ever worked at the park. Their parents drive up to get them. Quietly they leave the park. I am increasingly at a loss at what to say when I review these books. They all sort of start to blend together and feel the same. But what about this one, it's not a Goosebumps book after all? So I guess I can start with a comparison of this to a Goosebumps book. Is it just another Goosebumps book in disguise? Well... kind of. It is about the same length as a Goosebumps book. It follows the same basic format. Short chapters, lots of "cliffhanger" scares to get you hooked. Young teens getting into trouble. Certainly if this book was titled Goosebumps #63: The Beast it would not feel terribly out of place. That being said, it did feel ever so slightly different. I would say it was a little less goofy. There are less ridiculous leaps of logic. Though there were some plot twists they didn't feel as if they were trying so hard to come out of left field so much. They made more sense. There are a couple of specific books I'd like to compare it to. The first would be the HorrorLand books, for the obvious reason that these both take place in an amusement park. This one differs for a few reasons. 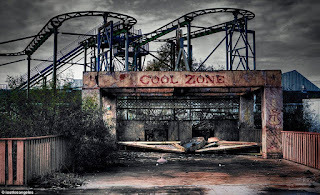 Firstly, HorrorLand is supposed to be scary. It's a little bit like going to a haunted house and then finding out it is ACTUALLY haunted. The park The Beast takes place in is just a regular old amusement park. The fact that it ends up being scary is more surprising in that way I guess. Also, for that matter, the park in The Beast is a real life park. 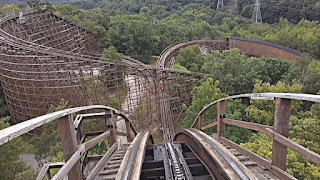 I have never been to Kings Island park but I bet for kids that have ridden the actual roller coaster this is about it would be an extra little bit of enjoyment. I had to google to find out if the park they travel back in time to is real as well. Sadly it is not. But that brings me to the next book I'd like to compare this to: A Night in Terror Tower. The reason for this one of course is the aspect of time travel. I think it's handled better and more interestingly in this book. Night in Terror Tower was more of a mythical ancient setting with sorcerers. The details didn't pop as much. In the Firelight Park featured here, we get a more real feeling of the times. It takes place during real historical events (The Depression) and features a relatively accurate depiction of an amusement park of the era. The lingo they use is a little silly but it's probably relatively close to legit. Can I judge this book without comparing it to its Goosebumps brethren? Well it is a pretty fun book for kids. It's interesting in that you don't necessarily know what to expect from it just from the cover and title. It doesn't aim to go all out crazy to surprise you though. 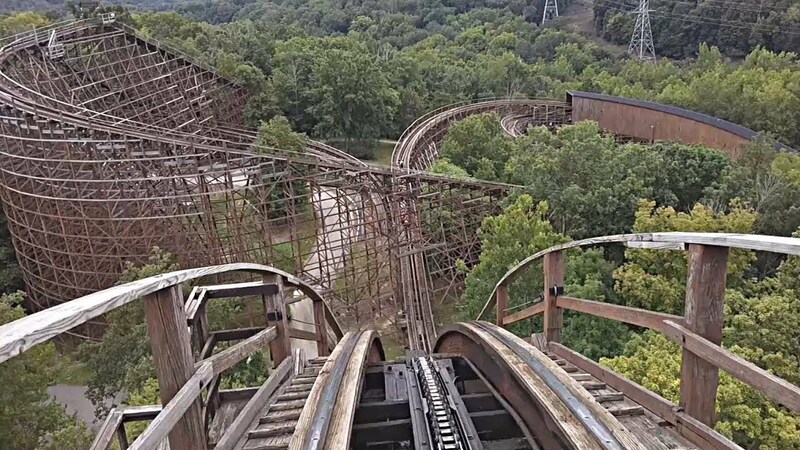 I think it would get the interest from any kid who loves roller coasters and maybe sucker them in to learning a little bit about history. Not that this is a history lesson or anything, but it brings up some topics kids of the era could have asked their grandparents about. I wouldn't all this the scariest book your kids could ask for, but I think its thrilling in its own way. Sure the ghost doesn't want to eat their souls, or murder their parents, but it does give them a bone chilling glimpse of a disaster of the past. Events they are doomed to be unable to alter. There is a little chill you get when you realize P.D. has been dead all these years and they were powerless to stop it. They were just lucky to escape with their lives. I rank this book pretty favorably. I mean, it's no timeless masterpiece by any stretch. But in the endless slew of R.L. Stine books he has churned out, I would rank it pretty highly. I think perhaps because it wasn't put in one of his known series like Goosebumps or Fear Street that it may have been overlooked by some. I certainly didn't know it existed until my friend sent me a copy she found at a thrift store. I say if you're a fan of Goosebumps or children's horror, give it a go. It holds up pretty decently. What do I have in store for my next review? Well frankly I am not 100% certain. What I do know is it won't be quite as delayed. Next month is Halloween and I will definitely have SOMETHING for Halloween. I'm just not sure what that is yet. I definitely have a lot of options. A lot of it boils down to how motivated I think I can make myself. So... I guess that doesn't necessarily bode well. I'll give it my best though! Until next time, thanks for reading.